A little rough pending the work breaks on superhero mode. 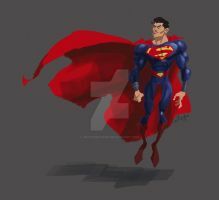 Great take on Superman. I've always preferred a simple suit design for him. I really like your style. It's cartoonish but also kind of realistic. I also like the shading. Also, my capes could use some work because I could never make them look that good. Great job! Thanks so much red !!! Your style is great! I love this! U ready 4 Superman V. Batman, cuz I can't wait!